Visit all five Missions of San Antonio! As a local, I encourage people to see the missions all the time. If you love history, old buildings, and want to visit something unique to San Antonio, you need to add the Missions to your list of things to do and see in the Alamo City. There are currently 23 sites in the United States that have been designated as a UNESCO World Heritage Site. The San Antonio Missions are one of these sites, added to the prestigious list in 2015. It’s just one more reason to see these buildings. Start with the Mission furthest south and make your way to The Alamo located in Downtown. The Missions follow the San Antonio River and can be reached by following the Mission Reach along the River Walk. They are spread out over several miles, however, so unless you plan on riding a bike, I don’t suggest seeing all of the Missions in one day via walking. The walk from The Alamo to Mission Concepcion alone is around an hour’s walk. Driving to each Mission is your best option if you’re trying to see them all in one day. 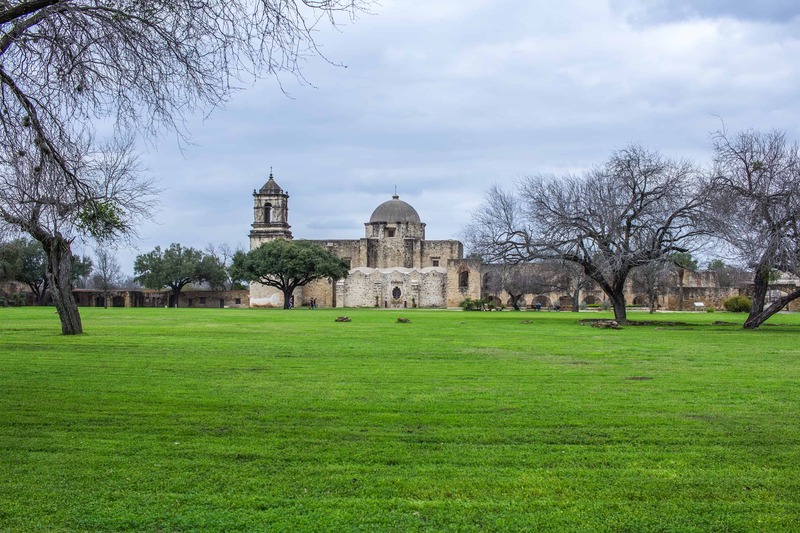 Together, the four missions outside of downtown form the San Antonio Missions National Historical Park. The park’s visitor center is located at Mission San José. Entrance Fee for all Missions: Free! If you’re traveling with dogs, bring them to the missions! (Never leave them in a car, especially in summer). Dogs are free to explore the grounds with you (on a leash) but cannot enter the buildings. There is also access to the River along the Mission Reach so there is plenty for your furry friend to see. Bring bags to pick up after your dog and water! See the end of this post for suggested products for your pet! Mission Espada (or Mission San Francisco de la Espada) is the furthest mission from downtown. It’s also one of the smaller and less renovated missions. The mission was established in 1731 along the San Antonio River. The church, the main building still standing today, was built in 1756. There is a mystery surrounding the construction of the doorway and you can learn about the original mason’s plan (or mistake) at the visitor’s center. Most of the surrounding buildings were destroyed in a fire in the 1800’s. Photo Tip: Visit during the morning. If you visit in the afternoon, the sun will be behind the church, casting a shadow over the front facade. Tours: Free tours are available on the first Saturday of the month. Mission San Juan Capistrano was established in 1731. The mission had several issues over the years (disease, attacks, political issues) but still prevailed. There were plans to build a larger church but those ambitions were halted in 1788 due to lack of labor. Mission San Juan is surrounded by farmlands and a 1/3 mile-long nature trail. It is the most serene locations of all the missions. There is more nature than buildings to explore, however. The church is small, most buildings are outlines of what once was, and the remaining buildings are part of a private residence. But, if you want to walk along the river and be out in nature, this is the Mission for you! Did you know? : Built by the Spanish colonists, the irrigation system comprising of canals, dams, and gates, known collectively as the Acequias, supplies water to all of the Missions. The complex system has been around since the early 1700’s, though the order of each segment’s implementation is unknown. To learn more about how the colonial residents of this area supplied water to the missions, check out the website listed a the end of this post. For a more hands on learning experience, visit the Witte Museum or the Botanical Gardens! Photo tip: The sun will be located behind the church during the afternoon. To avoid shadows on the main building, visit this mission during the morning hours. The full name for this mission is San José y San Miguel de Aguayo. Also known as the “Queen of the Missions,” it is the largest mission in San Antonio. Established in 1720 and completed in 1782, it was the “community center” for 300 Native Americans. The Mission has undergone two major renovations (in 1930 and 2011) to repair and restore the mission to its original design. You can roam the courtyard, the outer rooms, and the church, which is still in operation. The church is small and plain in comparison with those found in Europe, but the alter is ornately decorated. I took advantage of gloomy weather on a weekday in February to visit the Mission. Hardly anyone was there and I was able to capture the looming storm clouds. The best time to visit is during Spring or late Autumn when the weather isn’t too hot. I’ve never been to any of the missions when there were really large crowds, but some are more popular than others. Mission San Jose is one of those since its the largest and restored. Guided tours are available any day of the week at 10:00 AM, 11:00 AM, 2:00 PM and 3:00 Pm. Tours last around 45 minutes. Photo tip: Arrive during a time when tours are not occurring to avoid people. Also, be sure to walk behind the Church to see the oldest water mill in San Antonio! Mission Concepción is small in comparison with Mission San José, but where San José has had major renovations, Mission Concepción is the least altered of all the missions. In fact, it is the oldest unrestored church in the United States. The full name of the mission is Mission Nuestra Señora de la Purisima Concepción de Acuña and was dedicated in 1755 and overseen by Franciscan friars. The church is small with very little decoration other than a large chandelier. But, some of the painted frescoes are still visible. The entrance to the church is on the backside (there’s a sign) rather than through the main doors. In front of the church there is a grotto where visitors can light candles or pray. Also, across the street is an entrance to Confluence Park – a part recently built and dedicated to the preservation of the the San Antonio River and ecosystem. The unique pavilion is designed to catch water runoff. Mission San Antonio de Valero, better known as The Alamo, is by far the most well-known of the missions. For this reason it is also the most popular and crowded year-round by tourists and locals alike. It became famous during the Texas Revolution. The Alamo has a rich history, dating back to 1744 when its foundations were built. The Spanish military took control of the mission in 1803. The Alamo got its name from the company who occupied the mission, now fort: “The Alamo Company” named for its hometown of Alamo de Parras located south of the Rio Grande. The Alamo remained a military outpost when Mexico declared its independence from Spain. You can learn all about the events leading to the Texas Revolution and the Battle of the Alamo here. There will be plenty of learning opportunities when you visit the mission, too. There are several movies and exhibits within the walls of the Alamo. Photo Tip: There are always people visiting the Alamo, day or night. If you want a photo of this iconic building without a lot of tourists you’ll have to arrive early in the morning, preferably on a weekday or Sunday, before the mission opens its doors. Also, check for events planned on weekends as many 5ks will pass in front of the Alamo. What to expect: Aside from crowds, you should expect to see a very different surrounding from what you may imagine. The four other missions are in less affluent areas of town and are therefore surrounded by homes and farmland (with the exception of Concepcion which is surrounded by a school). The area is now protected from a lot of growth and commercialization. The Alamo, however, is on the edge of Downtown and in the center of tourism central. The first time I visited the Alamo I was shocked to realize that across the street was a mall, hotel, and tourist attractions like Ripley’s Believe It or Not. You’ll also notice the gift shop. Compared to the modest shops at the other missions, the Alamo offers gifts galore in a prominent space. Since it is a very popular tourist attraction, if you want a guided tour you’ll need to make a reservation. Click here for more information about tours. With all that being said, if you’ve never been to the Alamo, its worth the visit. If you have no idea what the Alamo is or why so many care about it, check it out because the site offers a lot of learning opportunities. Besides…When in Rome, right? To access the River Walk from the Alamo, there an entrance to the river directly across the street. You’ll walk past some waterfalls and walk through the Hyatt Regency hotel. Turn left to reach the River Walk Mall and the famous parts of the River Walk, including the restaurant Casa Rio and its iconic colorful umbrellas. Texas summers can get hot! With temperatures hovering around 100ºF plus humidity, you’ll want to be prepared before you spend a day visiting the missions. If you plan on walking/biking the SA River route, bring plenty of water, wear sunscreen, and don a hat! If you plan on driving, you should still dress appropriately for the heat. There is no dress code in the churches (unlike the Churches you may visit in Italy). The rooms in the Alamo displaying artifacts and information can get hot and stuffy (even in March with smaller crowds) so be prepared. The Alamo has the most amount of available outdoor seating outside if you need to take a break from the heat, otherwise you may be sitting down inside the chapels to escape the heat. Some of the missions are surrounded by nature (San Juan offers trails), so wear bug spray! I like to leave ice cold water. I use a Corkcicle tumbler to keep my ice frozen for hours. For a natural alternative to bug spray, and one that smells like lavender, try using Curealia’s bug repellent (safe for dogs, too). I am no longer an Amazon Affiliate member so the links attached to the images below may no longer work. But I still recommend these products so I’m leaving the images for my readers’ reference. If you’re traveling with dogs, don’t forget to bring the essentials: poop bags and water! Have you visited all 5 of the Missions? Share your favorite in the comments!